The rain trickled from the dark, night sky, casting a misty shadow on the city of Triopolis. Horseless wagons rumbled through the street, their tires whisking the water up in sprays and splashes as people crossing the streets calmly waited for their opening. The clean tan bricks clicked and clacked as crowds in frocks and dresses, vests and doublets, and robes and cloaks crossed one another. More than one nod or tip of the hat occurred accompanied by friendly gestures and smiles while some of the finer women shielded themselves with parasols of black, white, lilac, and a delightful assortment of colors. A lone, cloaked, and hooded figure stepped up to the edge of the pleasant scene, waiting for his chance to cross. “It’s come a long way, hasn’t our Triopolis?” The hooded man spoke clearly. The hooded man brushed off the beads of water collecting in his short, dark beard as he brought out his watch. He rubbed the scratched glass face and brought it close to him while more horseless wagons and even some horsed ones chugged and clopped their way past. “For the last time, call me Sid for heav’n’s sake.” Sidwig replied in his deep, goonish accent. “Eight years sh’uld be long enough ta know that Vlade! Anyways, Sidwug makes me sound like U’m some kind uh silly nanny.” Sidwig reached into his large brown robe and pulled out a small silver flask and started unscrewing the cap. “None of that.” Vlade scolded without even taking a glance as he stuffed his watch back into his dark blue doublet. The traffic cleared and the two men crossed the shining street, the bright moon pierced an opening in the clouds, reflecting in the puddles as their boots splashed. When they reached the other side, Vlade stopped in his tracks and looked to the east. The road cleanly split Triopolis down the middle with houses and neatly kept shops lining the city’s well lit downtown. But as the road faded and the city thinned, a faint, dark path twisted towards a jagged structure. Spires and turrets ominously lined the night sky up on a hill, and no light came from its silent stone, but the castle crouched like a beast waiting to leap upon its unsuspecting prey. Vlade continued on his path and the two came to a beautiful and well kept covered walkway. The path was covered by a large enclosing ceiling with large ornate pillars supporting it, creating a colonnade. “See this Sidwig?” Vlade said to his partner, as he pointed all around him. “Oi I see it.” Sidwig looked up at the brilliantly designed walkway. Glass supported by gold framing covered the open sky as the ceiling curved into elegantly designed carvings that swirled across the walls. The pillars were gilded with polished marble bases, while even the street seemed to shimmer a golden hue. Two masterful paintings covered by ornate, glass frames were hung on the sides of the walkway, directly facing one another in the middle. One depicted a great battle while the other showed a large metropolis thriving in the sunshine. A few people passing by in fine clothing looked at the two men with caution and gave them a wide berth. The two men exited the walkway and a large structure quickly came into their view. A massive stone cathedral stood before them and engulfed the sky with its large spires. The designs and stonework were so immaculate and ornate, one would need to spend a week studying the whole of them. Its spires gleamed, its buttresses amazed, its statues enthralled, and its stained windows dazzled all who saw it. Three massive pairs of doors led into the main sanctuary, all embossed with gold, jewels, and carvings inlaid into the mighty, rich, dark, wooden doors. Large crowds of people gathered and entered the monstrosity by troves. Just as the two men started to walk away from the plaque, a black, fluffy cat jumped up onto the base. Its green eyes shined and its large black pupils gazed to the two men with a curious look. “Good you could make it.” Vlade told the cat. “What did you find out?” The black cat meowed in a peculiar way as Vlade nodded his head. “Well that settles things.” He told Sidwig. Sidwig looked uneasily to the cat as Vlade walked away and he mumbled, “Talkin’ ta cats and the like… just ain’t right!” The cat meowed at Sidwig and it left towards the side of the cathedral as Sidwig was left to debate just how many swigs he had left in his flask! Bio’s and Fun Facts for part 3 and 4 of Triopolis! Written by Nathaniel D. Cull. All rights reserved by me! Please don’t steal my work! Vlade refocused his vision trying to find the brown cat that dashed into his sight, but he found it nowhere amongst the ruined cell. Turning to catch up to his allies, he had only taken one step when he heard a scrap… He paused; he knew someone was there. He could feel it. “But why hesitate? Why not just ask? Why are my hands shaking? I need my sword…” Slowly, Vlade’s hands grasped the hilt of his shimmering silver sword, and with a quick jolt he drew his blade and turned quickly as the metal flashed! A lone shadowy figure leaned in the corner, just out of the moonlight obscured by the darkness. “Hello Vlade.” The figure spoke softly. It was a woman’s voice to his surprise, but his tension eased little. The two men navigated Triopolis quickly and found themselves standing in an alley across from the sanitarium. Tan stone and bricks formed a solid structure with few windows. It was tucked into a corner on an uncharacteristically abandoned street of the sprawling city, like it was meant to be forgotten by all. Many of the houses around the sanitarium were abandoned and barred, finalizing that this was truly a corner in which bad children were sent to serve their time. Vlade gazed at the large stone building from beneath his faded green hood as he held his watch close to his face to see the time. “Almost ten…” Vlade said as he tucked away his watch. Bio’s and fun facts for part 1 and 2 of Triopolis! “Loche Dubois.” The black haired man said as he held out his hand to Sidwig. “Sid…” Came a reluctant reply as their hands met, “I thought you was a cat just a second ago! Glad U’m wrong ‘bout that!” Sid said with a chuckle. Vlade searched the littered cathedral as dust and dirt filled the air making it a musky atmosphere. He crouched and searched the ground around the blood stains of one of the monsters he slew as he carefully reloaded his pistol. “He’s an Earth Warder, Sid. Vlade and Sidwig met by one of the massive doors and looked to one another as crowds of people passed by. They then walked slowly inside and stayed along aside one another. The two men nodded to one another as they split into the main sanctuary of the church. A rich scent of fine woods filled their nostrils and beautiful colors filled the large room as candles and torches illuminated the masterful stained glass. My name is Nathaniel and I live in the United States. I love classical beauty in all things! I am an amatuer writer and have loved writing since I was a child. I believe it is all peoples' duty (but especially artists!) to promote goodness, love, and respect for one another and all things. I am also looking to become a 3d animator but I haven't yet started. Norsalam has started a donation pool! Neat effect from the coliseum in DOA6. That's a lot of pretty lady! I do no own any of the rights to Dead or Alive. Once again, I write to tribute what got me started on DA: Helena Douglas from Dead or Alive! Happy Birthday Dear! In a small gesture of admiration, I whipped up some Skyrim screenshots from one of my save games. All the lovely girls got dolled up and made it to Helena's little bash. Let me know what you think of the ladies, though the pictures are pretty basic. Enjoy! I might make some more tomorrow. Will I ever post them? Who knows? Just a fun little tribute to Helena Douglas Happy Birthday Lovely! Here, Helena gets ready to play a little music. She plays? Who knew! Lila Beth the playful Lilin! Lila Beth travels from Azura's Dawn Mansion (another great mod house from the nexus!) and leaves her husband Kagnarac behind for a girls night out. 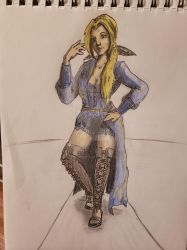 She used to be a devil, but since made a new living in the Forgotten Realms, then she and Kag took their jewelry business cross realms to Skyrim! The gracious host Violeta Lupei! Violeta and Neve just got back in time from Falskarr. Violeta is an alu in disguise and a talented lawyer from far away (From the Forgotten Realms of D&D). She used an orphanage as a cover up for her background, until she grew found of her children and wanted something better for them. She adopted in Skyrim of course. Sadhara Khalid, the curvaceous, crimson haired beauty stands at Helena's left. She takes some time away from the deserts of Kalimshan (Also Forgotten Realms) and dual wielding scimitars to attend to the party. Skyrim, Dead or Alive, Helena Douglas, Dungeons and Dragons, the Forgotten Realms and all mods are not my property. Lila Beth and Violeta are my original characters portrayed in Skyrim, and Sadhara Khalid is Aaron Cull's original character also merely portrayed in Skyrim. Posted a couple pictures of some characters in Skyrim (Helena and two OC's). I know, I shared something so don't be too shocked. I thank you so much for the fave. She definitely deserves that tribute.